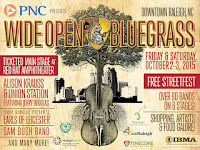 Arguably one of the greatest components of the International Bluegrass Music Association choosing North Carolina as the host of their Wide Open Bluegrass Festival, is the opportunity to discover new artists at the turn of every corner in downtown Raleigh. Last year was the second year Raleigh played host to the music event and the reception of the festival was clearly embraced as over 140,000 music fans filled the streets to listen to bluegrass music. For The Triangle Beat, one band that had us anticipating the return of the festival was The Railsplitters. Originally from Colorado, The Railsplitters are a bluegrass band that encompass all of the elements of traditional bluegrass music with the modern flare of some of the biggest names in the music industry. This was apparent at the 2014 Wide Open Bluegrass festival as the Hargett St. Stage became electrified by their performance. From their hypnotic vocals, to their incredible skills at playing a variety of instruments, The Railsplitters are sure to catch the attention of any music lover exploring the festival. Most recently, the band has released their sophomore album titled, The Faster it Goes. As you prepare for the upcoming days of IBMA Wide Open Bluegrass, check out a feature track off that album titled, "Tilt-a-Whirl." Find out more about the band and purchase The Faster It Goes by checking out their website. For a complete listing of showtimes, bands, and to purchase tickets, visit the IBMA website.